Ants in caravans can be a big problem. Once they have entered, it almost seems impossible to eradicate them. They can be very annoying, not to mention spoiling food and messing with electronics. So how do we keep ants out of caravans? shade, if there are ants in the trees they will drop onto the roof of your van. We had this happen to us in Cairns where we were invaded by green ants. They were so bad we asked to move to another site. When you are out on the road, use food containers with a sealed lid, or zip lock plastic bags. If you eat it, they will too. An old fashioned remedy which my grandmother used to have on hand is a mix of Borax and honey. If the Borax isn't available at the supermarket, try a hardware store. Some of the old methods are often the best, and this one has certainly worked well in the past. Just mix it up (small amount of honey) and place on a piece of cardboard in a couple of your caravan cupboards. Talcum powder is probably the most popular way (and cheap) to deter ants. Simply sprinkle it around any entry points to your caravan. Around tyres, jockey wheel, stabilising legs, and any other point of contact with the ground. Ants don't like crossing this dry material, but it has it's limitations in damp or wet conditions. Ants also detest cinnamon. Crushed up sticks of cinnamon sprinkled in the back of your caravan cupboards will not only deter them but also release a pleasant aroma. Surface spray used around the underside of your caravan will provide a barrier which will kill most insects. Use the domestic spray can which is readily available in supermarkets, or you can use a 'professional' insect sprayer which is also available in supermarkets in a 2 litre container with hose and spray nozzle. This one treats ants, cockroaches and spiders for 3 months. These are both chemicals, so use with care and according to directions. There is a commercial brand of ant poison called 'Ant Rid' and there are probably other similar brands on the market. This can be a handy little bottle to carry with you. 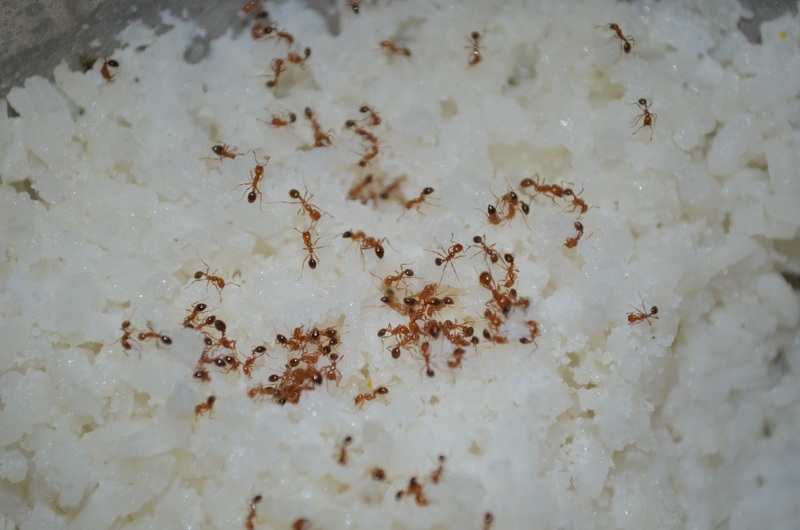 This product also comes in a bait type plastic container which only ants can enter, which is better to have around children and pets. 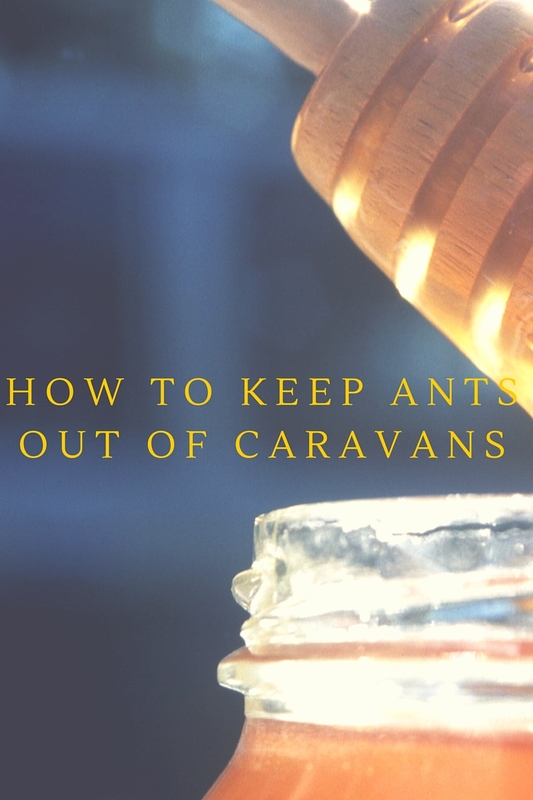 You can also place it around your caravan when you get back home to help prevent ants entering whilst your van is in storage. Don't forget to remove all food from your caravan pantry cupboards and fridge whilst you are not using it. Food that's left behind is very attractive to ants. We also had an infestation of little black ants while caravanning in Queensland a couple of years ago, which decided to make a home in our laptop. Of course we couldn't open the computer to sweep them out, so resorted to laying baits around, hoping they would come out on their own. They didn't, and months later they were still crawling on our hands when we were using the keyboard. If we had known some of these handy hints back then, it might have been a different story. Please leave your hint in the comment box below. Thanks.